Work, study and play With flexible study options that suit your lifestyle. Following a Flexible Study plan at Abbey Road Institute gives you the flexibility to combine work and study. From day one you will be immersed in the practical, theoretical, and creative journey you will be undertaking Throughout this time you’ll be supported and guided by the Abbey Road Institute team. By taking up a Flexible Study plan you will benefit from an extended period of learning during which you can maximise access our world-class facilities in Melbourne; have double more exposure to our guest lecturers and mentors; and focus on honing your craft and refining your portfolio. The best part of the Flexible Study pathway is that you work inside of the full-time program with the same access to lecturers and resources as the full-time students so you will never be treated like a ‘part-time’ student. A nominal Full-Time study load is 4 days per week (Mon – Thurs) with occasional Friday Masterclasses. Our Flexible Study Pathway allows you to choose either 1, 2 or 3 modules of study per trimester. This allows you to attend class on say Tuesday and Thursday whilst also fulfilling your other work and life commitments on the remaining days each week*. Individual study plans can be tailored to meet your needs by consulting with our Academic Manager. Feel free to contact us to discuss your study options today. * Course Progression Rules apply – you must complete all prescribed modules in Trimester 1 before progressing to Trimester 2, and all Trimester 2 modules before progressing to Trimester 3. We’ve made achieving your dream career easier than ever! Abbey Road Institute is happy to announce we are now offering Extended Payment Terms, which means you can study now and choose a flexible payment plan that suits you*. You choose the initial upfront fee you want to pay and the monthly repayments are set from there. You can set it and forget it with easy direct debit payments. The Abbey Road Institute Scholarship Program is aimed at supporting a range of values which we believe are core in the development of our students. 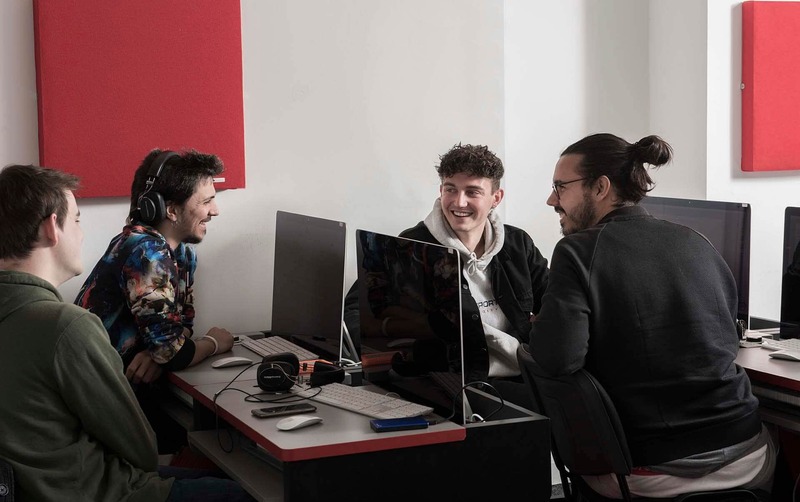 Whether through addressing issues of equity and equality by helping them overcome obstacles or barriers in starting their career – or by recognising and rewarding personal creative achievement – Abbey Road Institute in association with key partners remains committed to the continuing success of our students. Awarded scholarships relieve the recipient from a full study period (trimester) of course fees, unless otherwise specifically stated. Abbey Road Institute recognises raw talent and desire and encourages those who exhibit that passion to formalise it through education. This prize is awarded to those displaying outstanding musical or production talent. As part of an ongoing commitment to foster greater gender diversity in the production sphere of the music industry, Abbey Road Institute is proud to partner with Studios 301 to offer this award to women wishing to undertake formal education and enter the industry on their own terms. Not all musical talent resides in Melbourne or in one of our major capital cities which is why each year Abbey Road Institute award a limited amount of scholarships to students that have to relocate from regional or interstate locations. To apply for an Abbey Road Institute Scholarship, contact us today for more information and an application form. Our Advanced Diploma of Music Industry (CUA60515) program relishes small class sizes in a highly collaborative environment and offers a curriculum which has been developed in collaboration with Abbey Road Studio’s production staff and our wider industry network. Many modern professional studio environments have moved away from traditional console-based recording, so we have focused the program on current music production workflow which is driven almost entirely by software. We have a holistic methodology and deliver content in a practical hands-on learning environment. Therefore we introduce new concepts while giving you the opportunity to use industry standard technology. You’ll have access to a high-spec DAW workstation for the majority of classes and also full professional analog and digital recording studio with dedicated performance space. Our Advanced Diploma of Music Industry gives you 50% practical time throughout the course, with access to our world-class gear without limits on access. We are the result of 85 years experience that has only been available to those inside Abbey Road itself. Abbey Road Studios leads the music production world and has developed an education program designed to restore the craft of record production to the industry. Our approach to music production puts the student at the forefront. Our students form a tightknit community of like-minded professionals and peers. Our teachers, guest lecturers, masterclass and workshop presenters are all industry professionals. They have experience from all over the globe and impart their knowledge to the next generation of music production professionals. We create producers who have a firm grasp on the art of music. Therefore, our producers are performers as well as technically minded. Register your interest for our June intake!